So like this one time I stuffed mini chocolate chippers into raspberries and then stuffed those into a dream cookie. Why a dream cookie, you ask? Because it’s made with wholesome fabulosities like almond meal, coconut sugar, arrowroot. That’s it! Six ingredients straight out of your healthy-cookie-but-you’d-never-ever-know-it-dreams. Let’s rewind for a second. Before taking on Simple Mills‘ 12 Days of Cookies challenge, I had never made cookies out of cake mix. Like most cake mixes, this one called for eggs. I wanted to keep them vegan so I threw equal parts chia seeds and water into the mix and prayed for a miracle. And a miracle I received. These are some of the best cookies I’ve ever made. Ever. And it was a complete, utter, total, ridonculous ACCIDENT. These sorts of life-changing accidents need to happen more frequently. The best part about these cookies is that the mix is naturally gluten-free, paleo and vegan-friendly, dairy free, soy free, and low carb. The second best part is that despite all those healthy words, they truly have an incredible flavor and texture. I swear to you that no one would know they’re good for you. They’d think you were joking. Pulling their leg. Yanking their chain. The mix is made with just six ingredients, not counting rainbows and butterflies: almond flour. Organic coconut sugar. Arrowroot powder. Organic coconut flour. Baking soda. Salt. One cupcake/cookie/slice of cake using this mix has a mere 100 calories, 4.5g fat, 2g fiber, 6g sugar, and 2g protein. That’s like a fourth of the sugar as a normal cookie. I had a feeling these cookies would be game-changers because the weekend before these, I made the boyf chocolate chip pancakes using Simple Mills pancake and waffle mix. They were insanely delicious and I then became insanely excited to experiment with the cake mix. And how fun is it that the mix worked with chia seeds rather than eggs?! So the deal is that each cookie in this campaign is based on a certain personality type. Mine assignment was “lives for a surprise.” This person lives for the unexpected and is constantly filled with curiosity. I think this cookie fits me quite perfectly. If you know me personally, you know I go from one thing to next in the snap of a finger. I’m always looking for the next adventure, whether it’s trying new food, collaborating with a new company, writing for a new publication, or dreaming about future Alchemy locations. I love for creative freedom and I have a serious zeal for life. Enthusiasm is my middle name. Actually it’s Lauren. But really. Who doesn’t love a good surprise? Who doesn’t love to not know what adventure is hiding around the corner? I hope you didn’t read the title of this post in great detail so as not to ruin the surprise. Cookies > cake, in my humble opinion. Cookies stuffed with chocolate stuffed raspberries > everything, in my humble opinion. Delicious, healthy, grain-free cookies stuffed with raspberry and chocolate. Perfect for dessert or a snack! Preheat oven to 350F. Line a baking sheet with parchment paper or a Silipat. Place chia seeds and water in a small bowl. Stir to combine and set aside. Melt coconut oil. Add to a medium mixing bowl along with water, vanilla, and chia mixture. Stir well to combine. Stir in cake mix and coconut, mixing until well combined. Drop a tablespoon of “dough” (it will be moist) onto baking sheet. Stuff raspberry with 4-5 mini chocolate chips. Place open side down onto the dough. Top with another tablespoon of dough and gently press down with fork/fingers until raspberry is covered. Repeat with remaining ingredients until dough is used up, placing cookies an inch or two apart. Top each cookie with a few chocolate chips. Bake for 15 minutes. Cool for 15 minutes before using a spatula to carefully remove cookies from baking sheet. 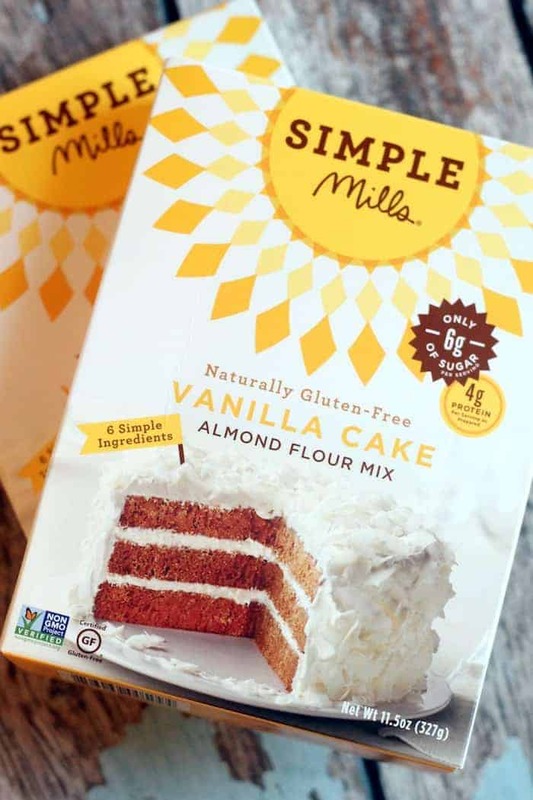 This post is sponsored by Simple Mills. Follow along with 12 Days of Cookies on Facebook, Twitter, Instagram, and Pinterest. Thanks for supporting the brands that support Hummusapien! I’ve GOT to get my hands on that cake mix! Six ingredients?? Hellerrrrr where have you been all my life. These look heavenly and like they should be in my belly by now.